Johor is a land of plenty. Its potential prosperity and wealth, is opened to be shared. Historically, Johoreans have been graciously accommodating all these opportunities to be opened for others, despite traditionally Johor had been the power base of progressive and productive Malay nationalism. In the more recent times, many have come to Johor to seek riches. 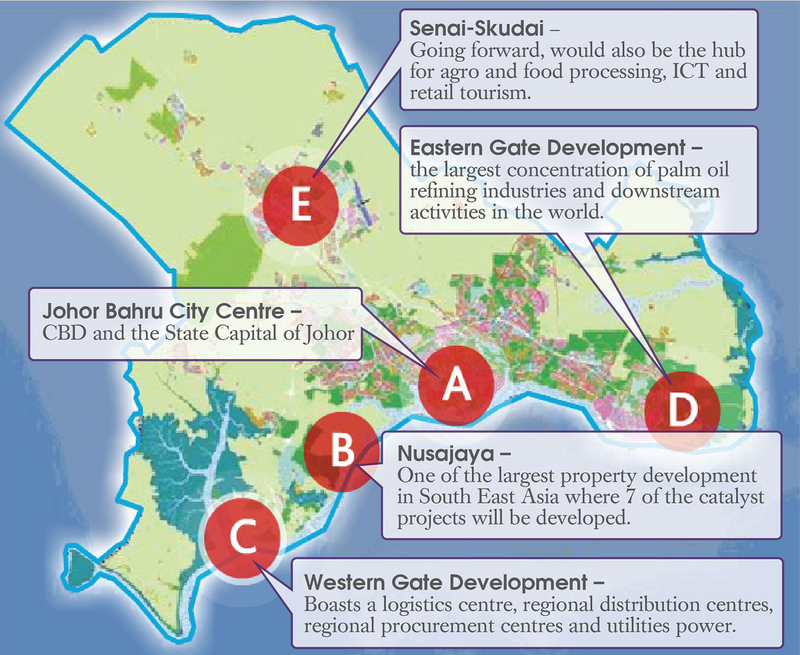 It has been intensified after November 2006, when then Prime Minister PM ‘Flip-Flop’ Dato’ Seri Abdullah Ahmad Badawi’s ‘Level Four Boys’-infected administration devised the South Johor Economic Region (SJER) master plan and got then Almarhum Sultan Iskandar Ismail of Johor to launch it as ‘Iskandar Development Region’ (IDR). IDR (later renamed Iskandar Malaysia) is set to play the complementary and supporting role to the Singaporean economy, which was steered and focused towards high value, capital intensified and knowledge based economy. Then, South Johor is to be what Shenzhen is to the ultra productive Hong Kong SAR. Amongst other roles, Iskandar Malaysia is to ‘tap’ into affordable housing market for the middle income Singaporeans which no longer can afford to acquire in the galloping property market of the republic. Of course, there are other vast retail and service-based markets to be exploited all over South Johor too. Theory has it, the potential from the multiplier effect from the SG Dollar is enormous. One success story of exploiting the potential of Johor Bahru and capitalizing on the Singaporean market is the ambitious contractor-turned-developer Tan Sri Lim Kang Hoo. He tried his luck since the late 90s. The opportunity knocked on his doorstep when Kumpulan Prasarana Rakyat Johor’s (KPRJ) spiraling downwards with the NPL-ridden-debt of RM 160 million from the rural infrastructure projects the Johor State Government embarked, with borrowed funds. Lim offered to settle KPRJ’s debts by taking over 350 acres what is now Danga Bay for a sum of RM 200 million. The vehicle is Abad Ehsan Sdn Bhd. and Straits Bay Sdn. Bhd. 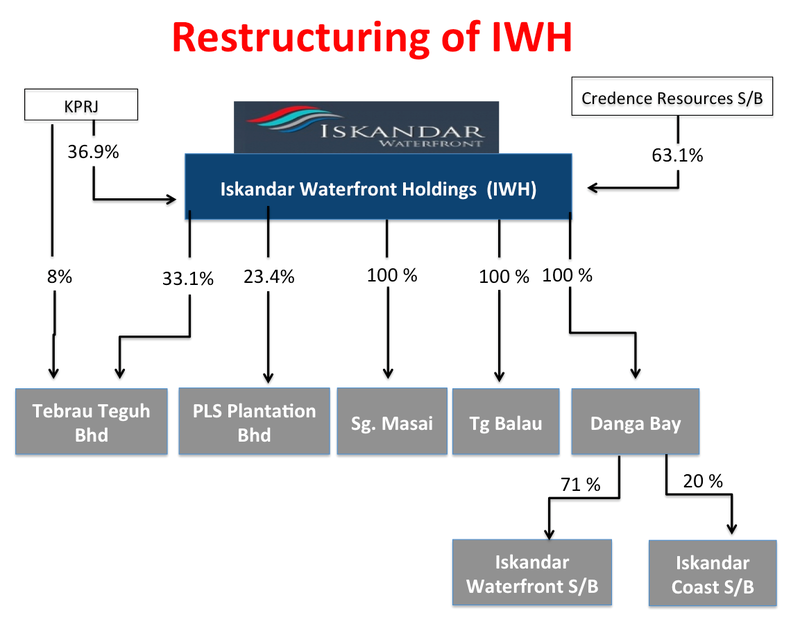 (both later were amalgamated and became Iskandar Waterfront Holdings (IWH) Sdn. Bhd.). Lim controlled IWH, via Credence Resources Sdn. Bhd. (CRSB). An agreement for the acquisition was signed in June 1999, although the debt was said to only be settled in 2005. KPRJ continued to bear the interest on the financing facility till 2002. It was settled when two other parcels (adjacent to the first deal) of 661 acres were acquired RM 43 million, by June 2001. The deal was so cheap because these parcels were underwater. Then there was the idea of Johor State Government should have interest in the Danga Bay development project. In 2004, KPRJ BOD approved that 30% holdings of Danga Bay should be re-acquired. Lim agreed and offered KPRJ to acquire 30% of what is Iskandar Waterfront Holdings (IWH) today. At the time, the 30% holdings of IWH was valued at RM 105 million. That triggered the exercise where 588 acres of KPRJ land transferred to IWH for the sum of RM 160 million. In 2004. KPRJ acquired 42.4% of Tebrau Teguh Bhd. (TTB), a diversified property development and construction company. After relinquishing a small portion, by 2007 the holding was reduced to 41.2%. By 2011, the East-West master development plan surfaced. It was about a comprehensive development plan where several major projects are being streamlined and co-odrinated. The co-ordination is about maximizing all the potential, in a comprehensive strategic plan as per envisaged under Iskandar Malaysia. 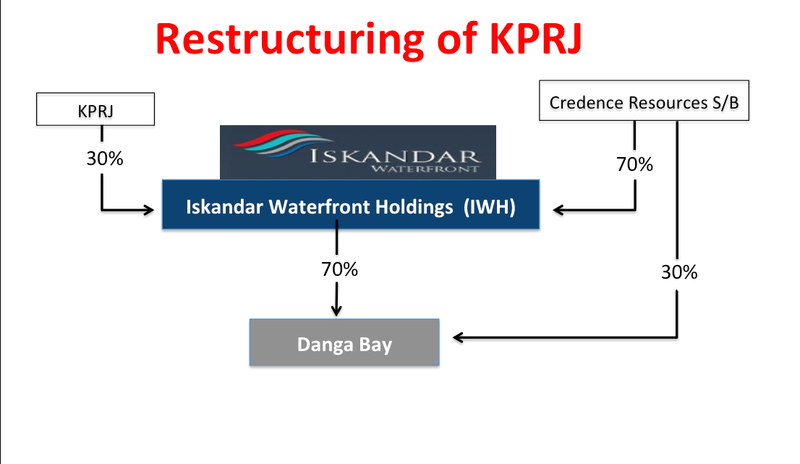 Johor State Government injected several KPRJ’s properties into IWH that raised their holdings to 36.9% and Credence Resources Sdn Bhd.’s reduced to 63.1%. In all, RM 620 million value of assets were hived off into IWH for the share-swap, which include 27.9% of Iskandar Waterfront Sdn. Bhd. valued at RM 360 million and 8% of Iskandar Coast Sdn. Bhd valued at RM 120 million. These two companies with premium properties are controlled by Khazanah Nasional Bhd. It is very strategic for IWH to acquire shares of companies where Khazanah has interests. It is about getting more powers that be to buy into Lim’s bigger scheme of business agenda. After this exercise was completed, the next corporate exercise is for IWH to propose the acquisition of TTB from KPRJ. In January, IWH offer was for 33.15% of holdings in TTB at 76 sen per share. The whole deal was valued at RM 168 million. At the time, TTB had 1,000 acres of prime land parcels of suburban Johor Bahru in the neighborhood of Kg. Bakar Batu, Permas Jaya and Senibong, which had huge potential to be developed as premium and luxury products. The acquisition of TTSB was completed by last August. This was a gold mine acquisition for Lim Kang Hoo. Considering that the nett reliasable area of the 1,000 acres is taken at 450 acres and the infrastructure and land conversion could translate the value of these parcels at RM 200-250 psf, that would translate to a gross development value (GDV) of RM 5 billion. After the completion of all these exercises and Khazanah is now a strategic business partner of IWH’s grand development plan of Greater Johor Bahru, via Iskandar Waterfront Sdn. Bhd. and Iskandar Coast sdn. Bhd., the next step in listing. Lim immediately had the right personalities and advisers to make plans to IPO IWH by June 2013. This is despite that IWH haven’t had the necessary profitability track record. Only with the huge land bank and the current market value of the aggregated assets worth RM 6 billion. It is something not entirely surprising, since many of the ‘Level Four Boys’ operatives are now in Khazanah. Recently, it was discussed that corporate maneuvres by these personalities had Lim as the benefactor, via IWH. The more apparent one is the restructuring of QSR and KFC, where suddenly IWH is one of the major stakeholder via the deal in Business Chronicles Sdn. Bhd. What was more important RM 600 million worth of ‘pre-determined properties’ were the prize for Lim to devour if and when the JCorp controlled Triple Platform Sdn. Bhd. (TPSB) fail to deliver as per the conditions in the ‘subscription agreement’ between TPSB and IWH Resources Sdn. Bhd. 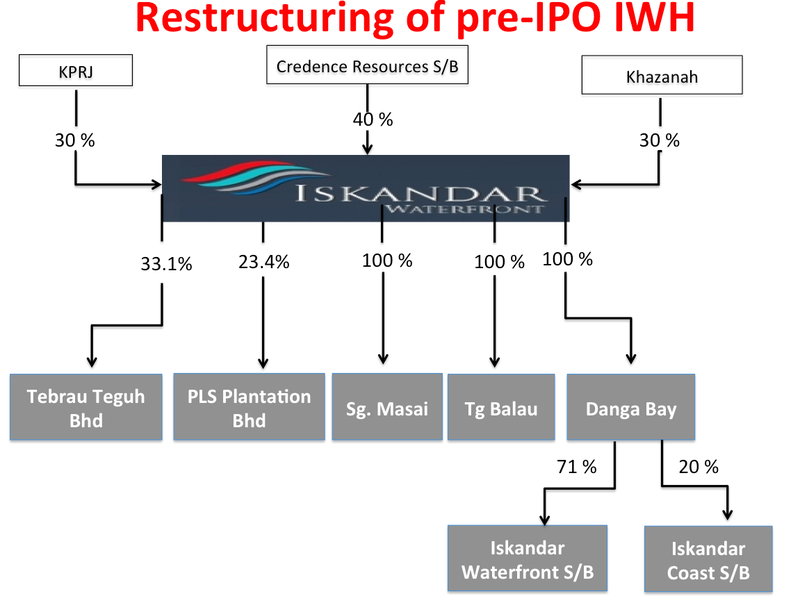 The corporate deal involving the injection of IWSB and ICSB and the value of the strategic parcels warrants Khazanah to own 30% of pre-listing IWH. Hence, it would not be a surprise to many if ‘Level Four’ personalities like Ganen Sarvananthan is the architect of the later IWH’s corporate exercises and the IPO, planned for June. The past six months, IWH is something Lim has been grandstanding about. It is so glaring especially the projects announced and joint venture partners are either local Chinese controlled companies or from Singapore and China. None of the Bumiputera property developers are included in Lim’s IWH scheme of things and projects. KUALA LUMPUR: Iskandar Waterfront Holdings Sdn Bhd, a master property developer, is expected to list on the local bourse in June in a deal set to raise more than US$300mil (RM909mil), two sources familiar with the matter told Reuters. The initial public offering (IPO) will see the Johor-based company joining a handful of listed master developers in Asia, such as the Philippines’ Ayala Corp and Japan’sMitsubishi Estate Co Ltd. These companies typically develop a region and have a number of property companies in their stable. “They are targeting a market capitalisation of some RM9bil,” one of the sources said, declining to be named as the matter was private. The targeted market value will put Iskandar Waterfront nearly on par with Malaysia’s largest property developer UEM Land Holdings Bhd. The company, whose units include locally listed developer Tebrau Teguh Bhd, has hired CIMB Investment Bank, Deutsche Bank, JPMorgan and RHB Investment Bank for the IPO, according to the sources. CIMB and Deutsche Bank declined to comment. The other banks could not be immediately reached for comment. Officials at Iskandar Waterfront were not immediately available to comment either. Iskandar Waterfront, which counts managing director Tan Sri Lim Kang Hoo (pic) and the Johor state government among its shareholders, is the master developer of 1,620ha of waterfront land in Iskandar, Johor. The development of the Iskandar region, which is being spearheaded by Malaysia’s state investment arm Khazanah Nasional Bhd, has attracted other developers such as China’s Country Garden Holdings Co Ltd, which has bought 11ha of waterfront land. Iskandar Waterfront’s listing is likely to be one of the first after a general election that Prime Minister Datuk Seri Najib Tun Razak must call by the end of April. Malaysia was the top IPO market in Asia ex-Japan in 2012, boosted by government privatisations and a strong economy but analysts and investment bankers said the IPO pipeline had slowed ahead of the polls because of concerns over market volatility. Malaysian stocks suffered their biggest drop in 16 months on Monday as investors worried about the risks of what is expected to be the country’s closest national election. Lim would be in management control of IWH post-listing. That would make him as an individual as the single largest shareholder of the greater IWH with assets at current value of RM 6 billion via Credence Resources Sdn. Bhd. Post-listing IWH would be the master developer in South Johor, which would be even much larger compared to the combined Khazanah’s Iskandar Investment Bhd. and Johor State Government’s JCorp. He would benefit immensely from the clout of being a partner of Khazanah. Considering that Khazanah owns other Malaysian corporate giants such as CIMB, TM, Celcom Axiata, TNB and other PLCs, Lim is set to go very far from his relationship that started in Johor and now well entrenched. This is not withstanding the fact that in the QSR-KFC restructuring scheme of corporate exercises, Lim is also a partner and has a much better ‘exit plan’ as compared to JCorp and EPF. This episode on how a contractor-turned-developer and eventually a property king in the Greater Johor Bahru area is an example how a non Malay businessman benefit immensely from the opportunity of continuous acquisitions and corporate maneuvers within a GLC, even though he did not start out with much. Lim progressed steadily without any Chinese politicians making a fuss either about the opportunities presented on his lap or his company’s corporate growth, which is all about being given the preferential treatment. Chinese chauvinist DAP politicians continuously strike against Malay businessmen in the likes of Tan Sri Syed Mokhtar Al Bukhary with political overtones but completely silent on Chinese businessmen like Lim. Considering that Al Bukhary Group actually proven to deliver and brought growth, value, employment and contributed immensely to the economy and Federal Government revenues and companies under Lim have yet to prove themselves, there is a stinging ill feeling by some Malaysian Chinese towards the Malay business group. Those who continue to harp that Chinese are treated as ‘Second Class Citizens’, please think again. No Malay businessmen ever gotten the preferential treatment like Lim despite Johor being an UMNO fixed deposit. You have left your post tantalisingly hanging…. Are we supposed to “read between the lines”? If Singapore is reforming and restructuring it’s economy (as it’s 2013 Budget and the ensuing debates in the Singapore Parliament indicate), and if there are consequent “spin offs” for Johor (and especially for the Iskandar zone), is that good or bad? Isn’t Malaysia also trying to restructure it’s economy to be “high value, capital intensified (sic) and knowledge based”? Pada suatu hari Kadok ternampak seekor ular sedang menggonggong sebiji telur ayam lalu ular tersebut meletakkan telur tersebut di atas tanah berhampiran rumahnya, kemudian ular tersebut pun berundur dan menghilangkan diri. Kaduk pun mengambil telur ayam tersebut dan dieramkan oleh ayam ternakannya. Telur tersebut akhirnya menjadi seekor ayam sabung yang cantik dan handal dan dinamakan Biring Si Kunani. Ayam ini sentiasa menang dalam semua pertandingan sehinggakan semua penduduk takut dan tidak mahu menyabung dengan ayam Si Kaduk. Kaduk menjadi resah kerana tidak menyabung dan akhirnya Kaduk menerima apa juga syarat yang dikenakan asalkan dia dapat menyabung ayam handalnya itu. Berita kehebatan ayam sabungan Kaduk mendapat perhatian daripada Sultan, lalu baginda mencabar Kaduk untuk menyabung ayam dengan syarat yang ditetapkan oleh Sultan. Syarat-syaratnya ialah: Ayam Kaduk hendaklah ditukarkan dengan ayam Sultan yang bernama Si Jalak Putih Mata . Pertaruhannya adalah kampung halaman dan isi rumahnya. Dan di pihak Sultan pula: Kaduk akan diberikan sebahagian kuasa memerintah dan kawasan negeri Perak jika ayam Sultan kalah. Tanpa berfikir panjang Pak Kaduk menerima syarat-syarat tersebut kerana sudah lama ia tidak menyabung ayam. Lantas dengan penuh debarannya Pak Kadok menunggu hari penyabungan ayam bersama baginda Sultan, Pak Kadok sekali lagi telah melakukan perbuatan yang tidak masuk akal. Dengan sebab majlis penyabungan ayam tersebut dibuat di istana Sultan, Pak Kadok telah merasakan ia perlu menyiapkan diri dengan pakaian yang lebih baik ketika hari penyabungan berlangsung. Pak Kadok sedar yang dia tidak mampu untuk membeli pakaian baru kerana dia adalah orang yang miskin. Dia telah meminjam sedikit wang daripada isterinya untuk membeli kertas kajang yang besar. Lalu apabila pulang dari pasar, Pak Kadok telah memberikan kertas kajang yang baru dibeli olehnya itu kepada isterinya untuk dijahit sebagai baju melayu, seluar dan tengkolok. Tatkala, bermulanya hari penyabungan, Pak Kadok telah memakai baju kertas yang dijahit rapi oleh isterinya itu. Sebagaimana yang dijangkakan pada peringkat awal, ayam Pak Kadok yang ditukarkan dengan Sultan telah menang. Pak Kadok pun bersorak sakan kerana ayamnya menang sehinggakan baju dan seluar kertasnya terkoyak rabak dan yang hanya tinggal Pak Kadok bertelanjang bulat. Sultan dan para penonton telah mengetawa dan mengejek Pak Kadok atas keadaannya ketika itu. Dia lupa bahawa ayam itu telah menjadi milik Sultan. Setelah pengumuman dibuat barulah Pak Kadok sedar bahawa dia telah dipermainkan oleh Sultan. Pak Kadok berasa amat malu dan terus pulang kerumahnya. Maka dengan berpegang pada janji dan syarat penyabungan Pak Kadok terpaksa menyerahkan kampung halamannya, isteri dan anak perempuannya kepada Sultan, hanya yang tinggal pada Pak Kadok sehelai sepinggang dan seekor kucing kerana masa Sultan mengambil pertaruhan kucing tersebut tiada di rumah, kalau tidak semuanya akan menjadi milik Sultan. p/s ganti sahajalah karekter Sultan, Pak Kadok dan Biring Si Kunani dalam ceritera ini, insyaallah maka fahamlah saudara akan maksud yang tersurat. 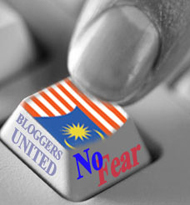 I hv been following your & ABITW’s articles on Johor & Lim Kang Hoo. So many ppl hv been talking about this. Ghani Othman was either too naive to give away anything & everything with regards to land & properties in Johor OR he is in it, together. Either which, AGO must GO! Next month would be his 18th anniversary as MB Johor & four terms is far too long. His tenure almost like a Ruler. It is unimaginable how Johor UMNO tolerated such a pompous & stuck up state liaison Chief, for so long. Banyak org cuba nak kaitkan Sultan Johor sebab Cina KL ni sampai boleh ada peluang utk mengaut tanah beribu ekar ni. Beri ribu ekar tanah dia ambik alih. Ambik tanah cam seluruh Bgn Sultan Ibrahim/Kota Iskandar tu sedara-mara dia punya. Pastu suntik lagi projek. Selagi ada, sumbat masuk. Share-swap la, injection la, acquisition la, take-over la. Macam macam alasan utk tanah tanah milik KPRJ habis dikeroyok! Cuai betul MB & SUK. Patut berhenti ja. Kalau degil, pecat! Senang. Pas tu panggil SPRM dtg utk siasat. Dah tu tentukan AG dakwa sapa sapa yg berkenaan. Buta buta ja, tanah utk pembangunan sebesar Singapura diserah habis. Pada Cina lak tu! Sorang Cina ja! Tak da ke syarikat Melayu yg mampu bangunkan?